Note: this is a guest blog from Richard Price, the Information Systems Manager at Yorkshire Ambulance Service NHS Trust. In simple terms, xAPI is just a technology standard, but it’s what we can do with it which is generating the most excitement in our respective pilots! Referring to embarking on a project as a ‘journey’ might be considered a cliché, but in the case of our xAPI pilot, I think the maxim is justified. I’ve been involved with learning technology for a number of years, working with a variety of healthcare providers to implement e-learning solutions. I first heard about xAPI in the spring of 2013 when it was in its infancy, making a tentative enquiry to Rustici Software (the creators of the Watershed LRS) as to whether we could assess the feasibility of implementing the technology in health and social care in the United Kingdom. Little did I realise at that point quite how profound the impact of my exploratory email was going to be! This blog post charts our journey with xAPI so far. Thinking back to my initial request, I was quite naïve in my early expectations. I knew I wanted to track the informal learning which we didn’t capture at the time but I hadn’t given much thought about what to do with the resultant data and how it would be of benefit to learners and to organisations. xAPI potentially offers the capture of a very rich but very large set of learner activity data which through analysis can begin to map an individual’s competence and confidence in a skill. Discussing my initial enquiry with Rustici, I soon began to realise the scale of the challenge we were about to undertake. Of the challenges which were presented, our biggest was undoubtedly the size of the workforce. The National Health Service (NHS) in the United Kingdom is one of the top 5 largest employers in the world, employing an excess of one million medical and clinical professionals plus support staff. At this point, we made a pragmatic decision to team up with my colleague in the south of the country and run two small, distinct pilot projects to gain maximum benefit from the results. I am based in York in the North of England, my colleague, Alison Potter, is based in Portsmouth more than 300 miles away, and Rustici are based in Nashville, across the Atlantic in the United States. The differences in time zone and geography led to many late-night, coffee-fuelled Skype calls as we began to develop our ideas, discuss outcomes and identify what learning activities we wanted to track. Working with the team, we were challenged to think about how we wanted to use the data and what we were going to do with it, not just how we were going to track learner activity. It would be easy to track everything but we knew we needed to limit the scope, so part of the work was to decide what and how we would capture information through xAPI statements. We knew we were on to something special when we realised the technology had the potential to start showing a return on investment in an individual’s training, being able to track the progress of an individual as they started to exhibit behaviour change as a result of learning interventions (Kirkpatrick levels 3 and 4). We later started referring to this as the ‘holy grail’ of learning. It was soon after this that our proposal was selected to be one of the six Watershed First organisations who are global pioneers like us, exploring how the technology can benefit learners and organisations. Being part of Watershed First gave us access to the Watershed Learning Record Store where xAPI statements could be recorded and further analysis performed. The Watershed First pilot also gave us sight of the ‘Watershed method’ – a scientific methodology to develop xAPI project outcomes and project benefits. The two pilots are distinct but share a common approach. In the South of the United Kingdom, Alison’s pilot focuses on recording learner activity around dementia care while my project in the North concentrates on tracking learning about patient dignity and respect, both of which are fundamental to the way patients’ view their care. Both pilots rely on a learner self-assessing their perceived competence in the subject prior to completing any learning interventions and then self-assessing after completing the learning activity to track the change. Similarly, we also track a self-assessment of the learner’s confidence before and after the learning interventions. It is our expectation that individuals will self-assess highly at the start of the learning intervention as they are unaware of their weaknesses. As a learner moves through the training it is hoped they begin to pause and reflect on their behaviour and become more aware of their performance, scoring themselves lower following the intervention. We hope to demonstrate behaviour change as learners move from the “unconsciously incompetent” phase of the competence learning module to “consciously competent”. The learning interventions consist of the mobile self-assessment checklist, a formal piece of e-learning, simulated practice, accessing online journals and online resources and a workplace assessment, all of which generate xAPI statements captured in the Watershed Learning Record Store. Successful completion generates an Open Badge, linked to accomplishments in the Watershed LRS. The pilots are underway in both regions with results expected in the spring of 2015. “if this was meant to be easy, somebody would have already done it”! The questions have often been challenging and we are still carefully observing how learners react to this different form of self-paced learning, but early indications suggest that the learning has been received very positively. Alison and I hope to update the results of our pilots in future blog posts. Seeking guest bloggers! 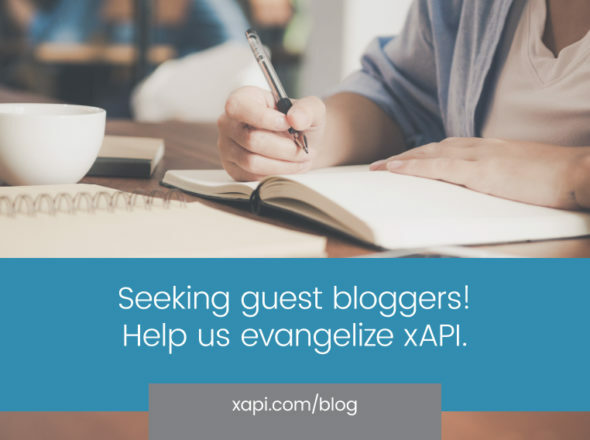 Help us evangelize xAPI.